Here's the thing: the Indian culture is obsessed with jewelry. Not in a troublesome way, au contraire, but in a magical way. Jewelry is considered part of the life cycle – right alongside birth, coming of age, marriage and motherhood – and has a place of honor in nearly every ceremonial event. So it's no surprise that Indian jewelry possesses a certain kind of magic in and of itself, and contemporary designer Hanut Singh has definitely managed to bottle some of that pixie dust and make it available for the rest of us. Using the groundwork of the traditional Indian model (high-karat yellow gold, rubies, enamel, diamonds and pearls) and adding his own fashion-forward take (surprising gemstones, architectural silhouettes, Art Nouveau and Deco influences), Hanut has managed to teach an old dog new tricks and it has us in a bit of a tizzy. Read on to see the earrings that will surely break your heart because they're so good. Unless you can buy them. Then we're about to make your day. 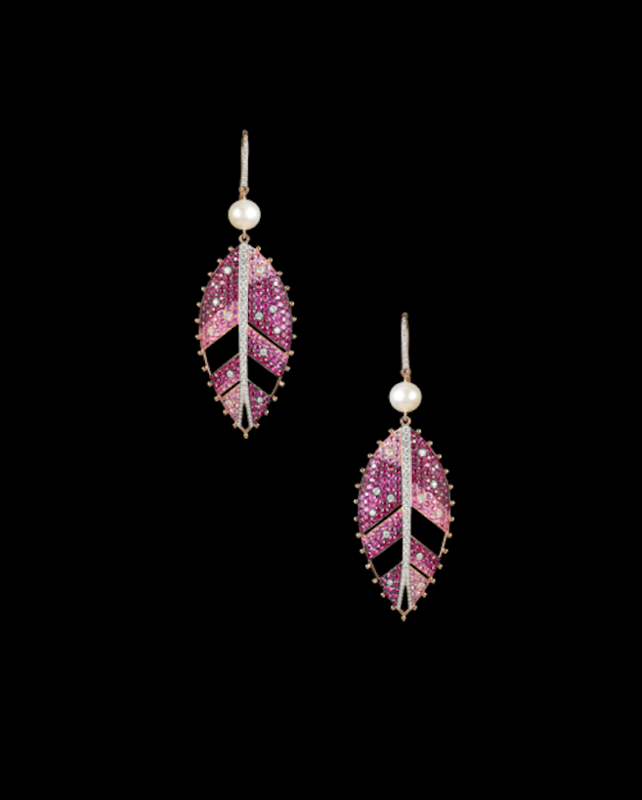 Glitterbomb leaf earrings in rubies and diamonds with a pearl accent. 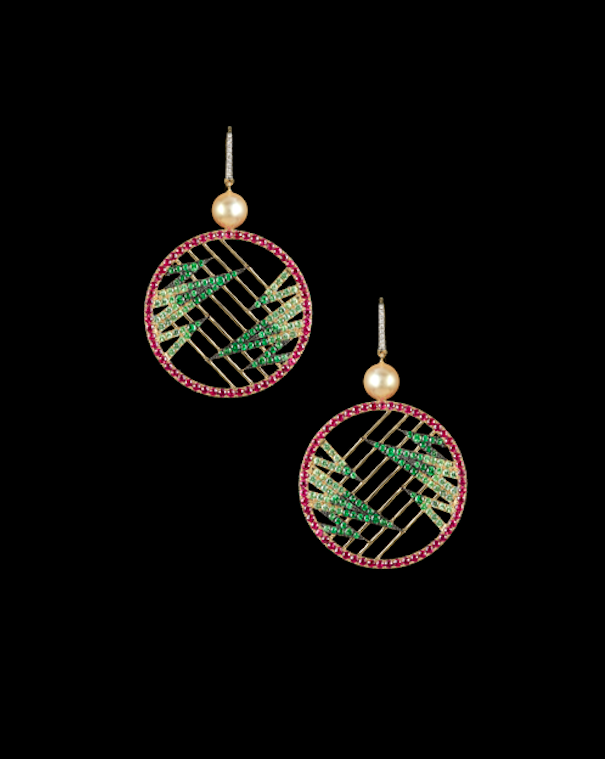 Zig Zag earrings in emeralds, rubies and diamonds with pearl accents. 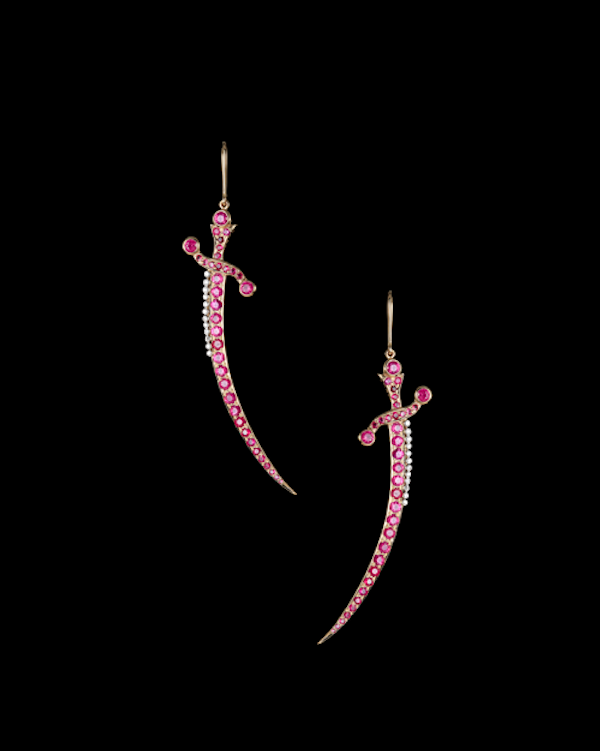 Talismanic Dagger earrings in rubies and diamonds. 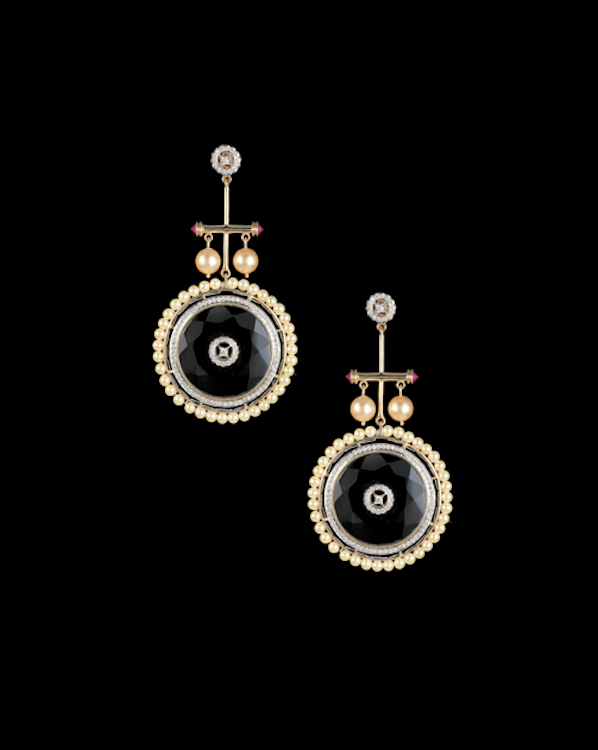 Wheels of Life earrings in onyx, diamonds and pearls. 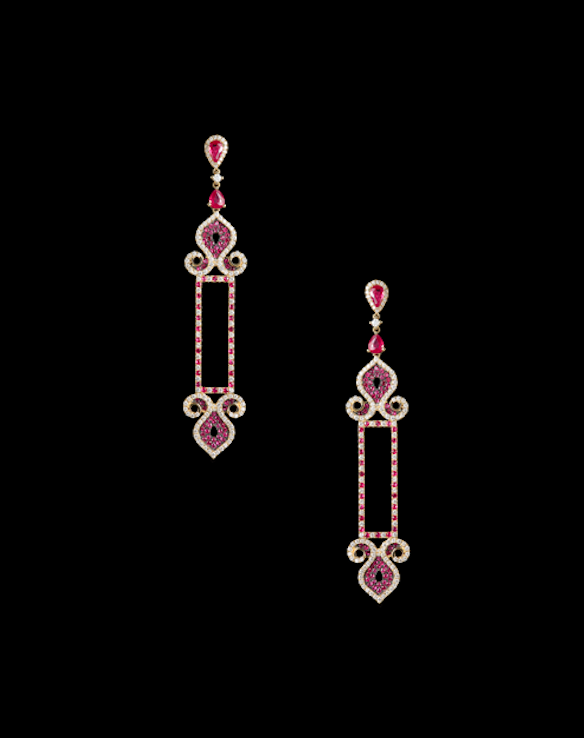 Aurora earrings in ruby and diamonds. 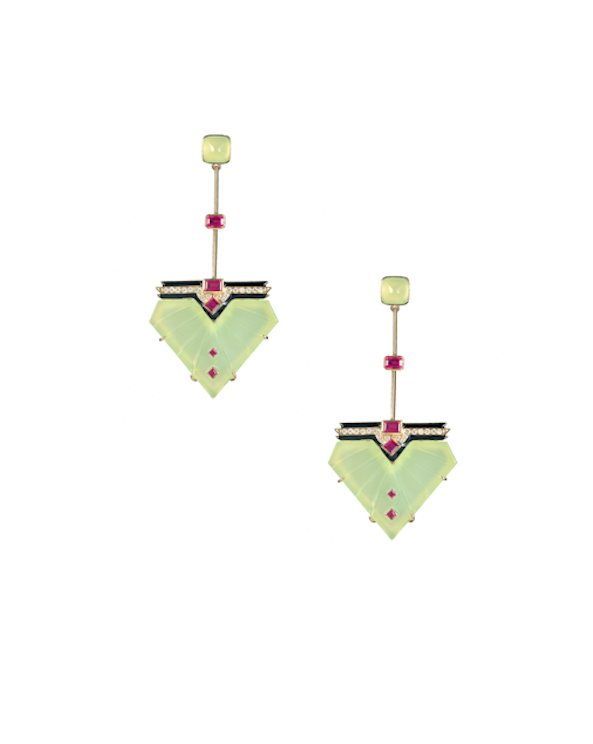 Bring it Back earrings in chalcedony, enamel, ruby and diamonds. 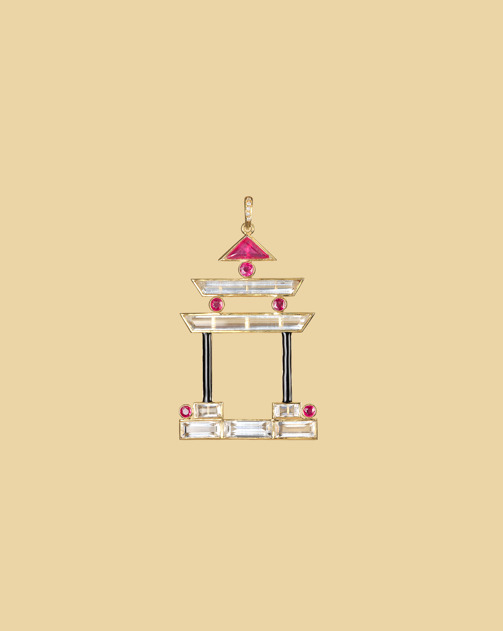 Pleasure Palace Pagoda pendant in rock crystal, ruby, enamel. 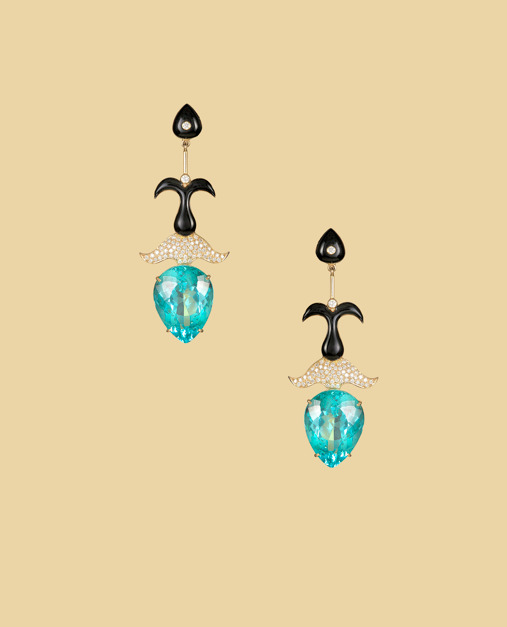 Mystical Sea Creatures earrings in Paraiba tourmaline, enamel and diamonds. 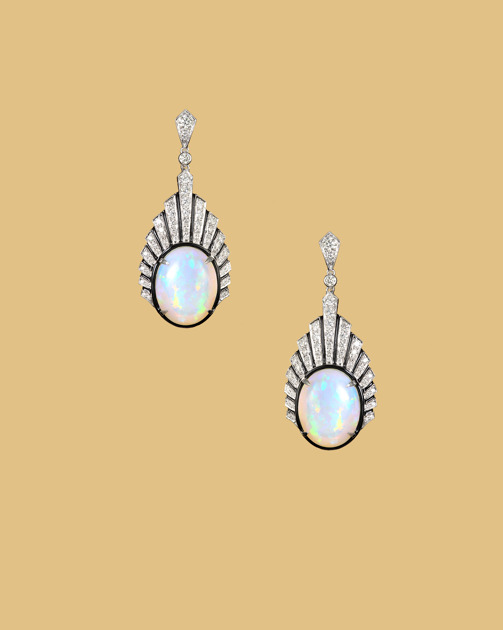 Crested opal earrings with diamonds. 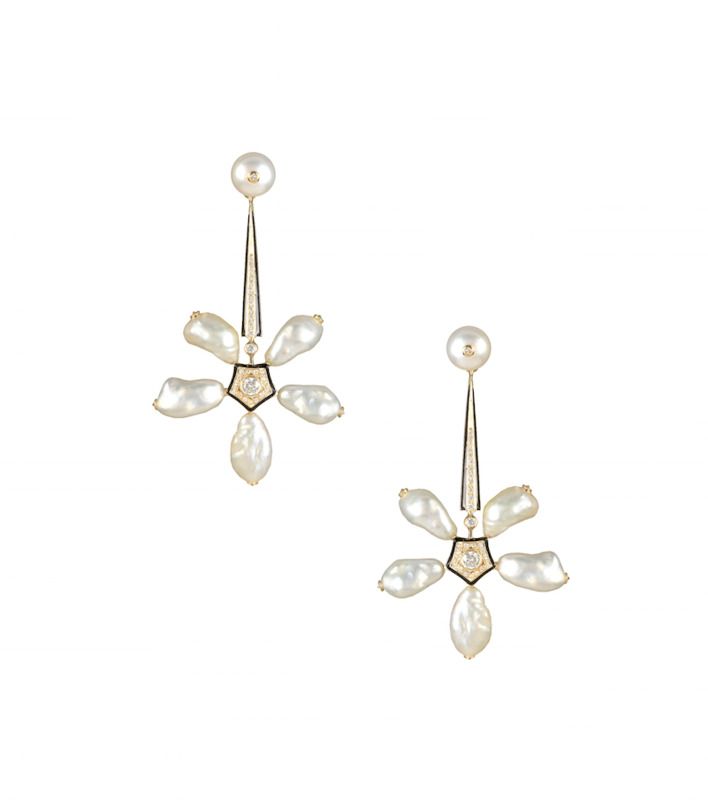 Narcotic Jasmines earrings in natural pearls, enamel and diamonds. When in Delhi – my favourite restaurant is this jebab place called Have More. Old school and swoonworthy! I order the famed tandoori chicken, mutton kebabs and a butter naan. My mouth is salivating writing this! I would love a solid gold bracelet by Ted Muehling, some more gold men’s sculptural bracelets by Robert Lee Morris and a beautiful golconda ring by Viren Bhagat. Some JAR wouldn’t be amiss, either. My home in the hills in Mussoorie, India. The Snow Leopard by Peter Mattheissen. Intense red spinel. As well as paraibas and padparadscha sapphires. My window frame earrings set in ruby and diamonds and my glitterbomb leaves. Very intricate settings and so they needed to come out perfectly. A Cartier three band ring. Madonna. And Leonardo da Vinci. His proportions slay me. What’s the most sentimental piece of jewelry you own and tell us the back story. A golconda diamond ring made by Cartier for my grandfather. It’s sublime. The stone is spectacular and the setting so chic. These kinds of things don’t come by easy. And they have sentimental value. I also love my own designed golconda diamond ring i wear daily. Its a part of me and is my talismanic protector. My SUV. Comfort all the way. Junior Vasquez. Madonna. Alice Smith. Quentin Harris. Kristine W.
My chef does a great job with yummy Indian food. A wooden dial Cartier tank. Donatella. Chanel. Dior. It would be thrilling to see the masters at their heightened best. Couture for Chanel and Dior. And Alaïa too. Fun! Cleo Spa in NYC for a facial. Simple Korean facials that deep cleanse and massage the face. Heaven.